My last post of the suspension bridge of which you can kind of see here was a preview to Taroko National Park in eastern Taiwan. 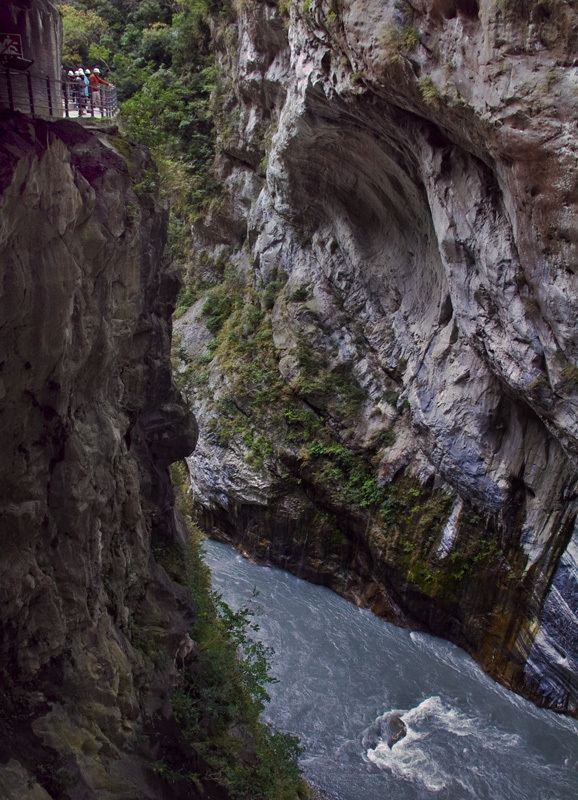 Taroko means "magnificent and beautiful" and one of the seven national parks in the country. But, before proceeding to the Swallow Grotto Trail not far from the park's entrance, all visitors must wear a helmet due to falling rocks that have injured and even killed tourists. We stop here to pick up our helmets. This worker cleans each helmet after they have been returned. It does not look like a fun job. The Swallow Grotto Trail begins here. The tunnel to the left is for cars and the tunnel to the right is for pedestrians. The trail was named as such due to House Swifts and Pacific Swallows that come to nest nearby, but I did not notice any while I was there. The cliff wall is very close to the the pathway so I assume some people have tried to climb it; thus, the posted warning sign. Looking back at the tunnel we just exited, you see the narrow trail in-between the gorge. You can see people walking along the trail at the top and it is a long way down from there. It can give anyone a case of vertigo. The boulders at the bottom of the Liwu River are marble rocks; hence, the nickname "Marble Gorge". You can now see the abundance of natural marble in this part of the country to build statues and such as seen in some of my previous posts. I like these walking trails. Nature at its best. The two tunnels in the pictures look like a hollow eyes. what a very beautiful gorge, would love to take this relaxing walk as well. Gosh, I'm having vertigo looking at the photo. what amazing pictures! I think I would like to see it for myself!! so beautiful. it must have been a real treat to see this place up close.